Just as you have safety features such as smoke detectors in homes, cars need them too and the most common one is usually a fire extinguisher. Don’t get me wrong, there are other built-in protection features such as safety belts and the like, but for putting out fires, you must have a fire extinguisher for cars. That said, it might not be very common to see cars catching fire but, in the event that it happens, it’s better to be safe than sorry. For this reason, this article looks at some of the best fire extinguishers that you get for your car so as to improve its safety level. H3R’s Performance HG100C stands out as the best automotive fire extinguisher because it contains an electrically non-conductive distinguishing agent (halotron 1) that causes no damage or thermal shock to the car’s electronics as you put out the fire. The product also leaves no mess behind as it is a liquefied gas that contains no solid compounds. This also means that it easily penetrates to the hard to reach areas, making it more effective at putting out the fire. A compact, lightweight and durable, high-quality steel cylinder is used to store the rechargeable liquefied gas distinguisher while an all-metal valve discharges it on the press of the lever. Though expensive, you also get a steel strap and mounting bracket, a color-coded gauge to show the operating status and a high gloss chrome finished cylinder that makes the unit a favorite for show cars. Combined, these features make the HG100C the top-rated fire extinguisher for cars in this review. For a relatively small car fire extinguisher, the FIAFESA5 from Fire Alert has a large mounting bracket that is used to keep the cylinder within easy reach in your car. This design ensures that the canister is extra stable so as to prevent any damage to your car while also making it easy to mount a new cylinder. With the extinguishing agent being non-rechargeable, a metal pull pin plus safety seal are included, helping to prevent accidental discharges that would otherwise render the canister useless. The product has a UL rating of 5B:C, which means that it can effectively cover 5 square feet when putting out fires from flammable liquids such as oil, grease, and gasoline, and can also handle fires from electrical equipment. A large and easy-to-read pressure gauge is also included and despite having all these features, the product is very affordable, making it easily accessible by most car owners. 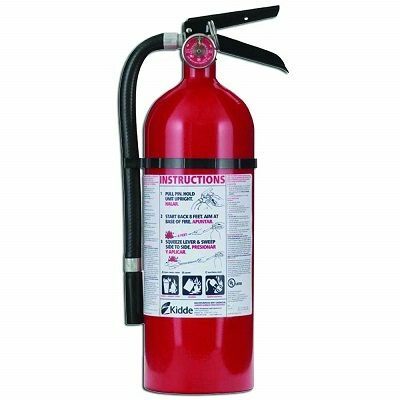 If you are looking for a multipurpose fire extinguisher, then the Pro 210 from Kiddle should be on your radar. This is because it has a class A, B and C UL rating, which basically means that its dry chemical extinguishing agent that can put out fires involving wood, trash, paper, plastics, flammable liquids and live electrical equipment. Because of this, the product is a suitable safety feature in offices, schools, hotels, churches and of course, cars. The distinguishing agent is highly compressed to an operating pressure of 100 PSI and this results in a quick discharge time of 13 to 15 seconds, covering 10-15 feet in the process. To help maintain this high pressure, a strong, durable and lightweight corrosion-resistant aluminum cylinder is used, and it is coupled with a tough aluminum valve assembly for agent discharge. Other features include a wall mount (no car mount included), rechargeable agent and a pressure valve that shows the pressure status at a glance. 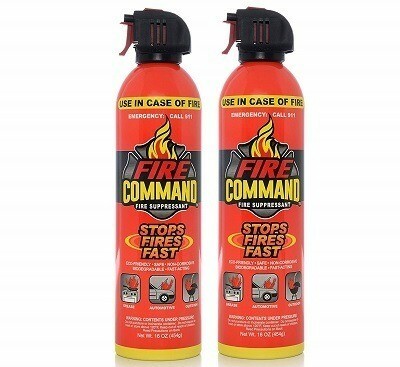 With affordability as an advantage on its side, the Fire Command fire extinguisher is also the smallest unit in this review. Although this means you get a less distinguishing agent, it gives you the convenience of a compact canister that is lightweight and easy to handle, making it suitable for boats, RVs, camps, offices, and cars. The cylinder is actually small enough to fit in the glove compartment, meaning that car mounting may not be necessary. Recyclable aluminum is used in the construction of this cylinder and its actuator valve, making it safe for the environment. The distinguishing agent inside follows suit by being fully biodegradable and non-corrosive, making the entire piece environmentally friendly. 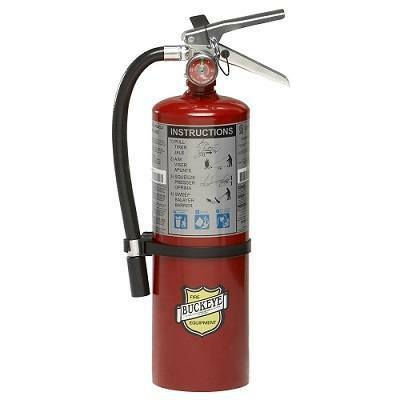 Buckeye’s 10914 is also a multipurpose fire extinguisher for cars, which basically means that it can be used on class A, class B, and class C fires. However, the product’s biggest strength lies in its highly pressurized 5-pound cylinder, which keeps the dry chemical extinguisher at an operating pressure of 195 PSI. This results in a wide discharge range of 12-18 feet, in which the whole canister can be drained out in 14 seconds. For the actual discharge, a corrosion resistant anodized aluminum valve assembly is used, making the system strong and durable, while a color-coded gauge shows the operating status at a glance. H3R is well known for packaging their products in high-quality steel cylinders that have a good-looking chrome finish, making them a favorite choice for show cars. This extinguisher is no different and apart from the aesthetics, it performs very well in putting out class B and C fires using its siliconized sodium bicarbonate dry chemical agent that contains free flowing and non-caking additives. These additives help in ensuring that the extinguishing agent remains free-flowing and usable up to the time it is utilized. Though quite expensive, the product includes other features such as an all metal valve construction and a 5-8-foot discharge range. Fire extinguishers are usually classified based on their UL numerical rating, which is primarily broken down into Class A, Class B, and Class C.
This class of fire extinguishers is responsible for putting out ordinary fires involving paper, wood, plastics, fabrics etc. 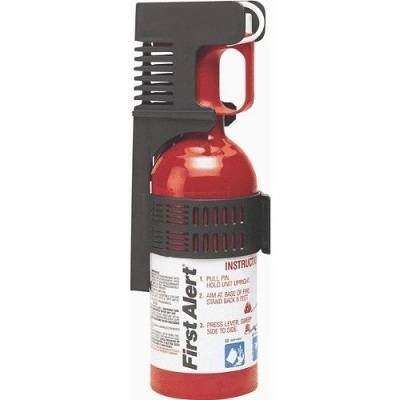 Class B extinguishers are designed to put out fires emanating from flammable liquids such as gasoline, oil and the like. Class C extinguishers contain non-conductive agents that are effective in putting out fires coming from live electrical equipment. The non-conductive agents prevent the current from running back to you, causing the shock to reach you. Most car fire extinguishers have Class B and C rating because gas and electrical faults are the most common cause of car fires. However, some have agents that encompass all classes, making them multipurpose extinguishers that can be used in offices, churches and other universal applications. Another thing that you may note are numbers in front of the A, B or C rating, for instance, 3A:40B: C.
Each A rating is equivalent to 1.25 gallons of water and therefore, 3A means the extinguisher is as effective as pouring 3.75 gallons of water into the fire. On the B section, the number signifies the square footage that the flammable liquid extinguisher can effectively cover, which in this case is 40. A fire extinguisher’s discharge range basically means the distance that the projected jet of the extinguishing agent can be sprayed in order to put out the fire. It is usually determined by the operating pressure of the cylinder in which, the higher the pressure, the longer the range. The longer the range, the better because this will enable you to tackle the fire while standing at a safe distance. 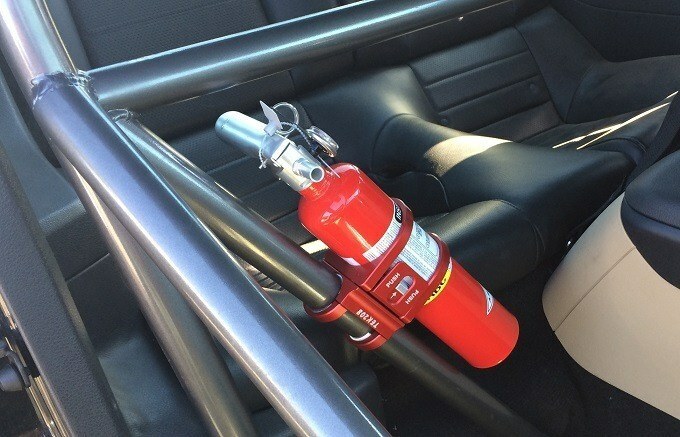 Since it is meant for use in the car, the fire extinguisher should not be too large such that it cannot be mounted comfortably where it can be reached easily. However, it should also not be too small to the point that the extinguishing agent is not enough to put out a small flame before it becomes unmanageable. Weight goes hand in hand with the size factor in that, the extinguisher should not be too heavy to handle, either when mounting it on the vehicle or when putting out the fire. The most comfortable weight should be between 1 to 5 pounds. A fire extinguisher should be structurally strong and sound enough to hold the pressurized contents inside while also being as lightweight as possible. To achieve this, the best units should have either an aluminum or a stainless-steel construction. The valve assembly should also have a sturdy metallic structure that can handle the high pressure when discharging while also being very durable. Another important factor to check is whether the extinguisher cylinder is refillable or not. Non-rechargeable fire extinguishers are designed for one time use after which you must buy a replacement, which costs more in the long run. On the other hand, rechargeable extinguishers might be a bit more expensive to buy, but you will spend less later on when refilling after using it for some time. This is because you won’t have to buy the cylinder again. #1. What Causes Cars to Set on Fire? There are many things that can cause a car to set on fire. These include electrical short circuits in the wiring system, an overheating engine that reaches dangerous temperature levels, fuel leaks in the engine, fuel leaks due to crashes, arson, problems in the exhaust system etc. This list goes on and on and it also includes natural causes as well as manufacturer defects. #2. What Should I Do if My Car Catches Fire? If you smell anything burning out of your car as you drive, the first thing to do is to pull over immediately and turn off the engine. This will shut down most of the electrical lines as well as fuel lines, reducing the risk of the fire developing and becoming unmanageable. Make sure everyone is out of the car and then call for emergency services. In the meantime, if you have a fire extinguisher in the car, you can try to put out the small flames or smoke. If the smoke or fire is coming from the engine, do not open the hood fully as this will increase the air flow to the source of the fire, causing it to grow. Instead, open a partial window and spray as much of the extinguisher as possible from this space. #3. 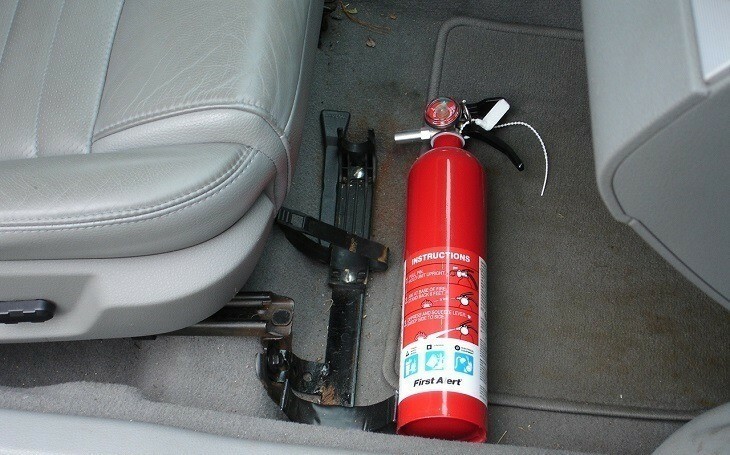 What is the Best Place to Keep Fire Extinguisher in the Car? Keep in mind that during such an emergency, you won’t have the time to access the extinguisher if it is deeply hidden. However, it should not be highly exposed because it may ruin your car’s interior. Therefore, the best place to mount the cylinder is just in front of the front passenger’s seat. This gives you quick access from both the driver and passenger’s side for quick response whenever fire or smoke is spotted. In conclusion, a car fire extinguisher is a critical component for the safety of both you and the passengers you have in the car. Even though you might never have to use it, it is still important to keep yourself protected at all times. Having gone through the review above, you should be in a better position to pick the best fire extinguisher for car that will enhance your safety against car fires.